The numbers say that from a pure return on investment, radiant barriers are not the place to start saving on your cooling bill. According to Jerry Thieken, an energy consultant with SRP in Phoenix, a homeowner with R-30 to R-38 insulation probably won't get much more help from a radiant barrier. Why Waste Your Money On Recommendations That Have Little Impact On Your Bills But Fatten The Pockets Of Those Installing It? For An Honest, Unbiased Energy Audit, Call Rosie Certified Green ID For A Free Second Opinion. Radiant barrier insulation makes use of reflective materials, often foil, to keep heat from entering through the roof into your attic. If installed properly, radiant barriers can be of benefit in an attic with very poor insulation. But for the homeowner who already has R-30 to R-38 insulation in the attic, it won’t help much. Most estimates for installing radiant barriers cost thousands of dollars. This means radiant barriers take decades, rather than years, to pay for themselves. 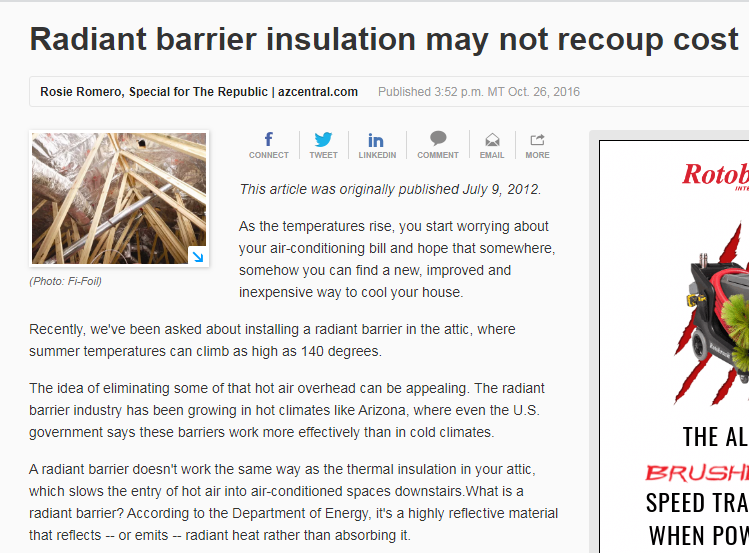 Either having insulation or radiant barrier, but not both, will help. Radiant barrier is overkill and if you are paying more than $1000 for a 2000 sq ft single level home or $500 for a 2000 sq ft 2nd story home, you are overpaying. "Result in a 2 to 10 percent reduction in the cooling portion of summer utility bills" 4% reduction for $3000? No thanks.